The most remarkable thing about this look at economic development in the United States since 1870 are two things: the size of the book, and the fact that it is readable. While size and subject are intimidating, the writing style is friendly and accessible, even to non-economists, and one comes to see the advantages of having all this information in one book rather than in several. Published in 2016 by Princeton University Press, this work must be a source of pride among those who worked on it. It is has real weight. Since I concentrated my efforts on conclusions rather than proofs, I only skimmed this Hummer-of-a-tome, but I found that each chapter had something useful, surprising, and remarkable about it. What Gordon is saying can have startling implications for how we look at the next forty years economically-speaking. His forecasts will matter to how we construct public policy, e.g., growth will continue to decline, wealth inequalities will continue to increase. Even if he is only showing us the outcomes of what we have wrought, intentionally or not, he helps us to envision what comes next. 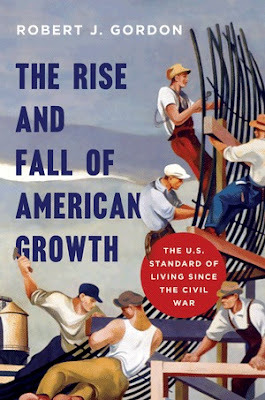 As his title foretells, Gordon tries to explain the extraordinary rise in productivity from 1928-1950 and its decline from the 1950-2014 by saying that big innovations along with education and WWII spurred a growth we haven’t seen since, and that even the technological revolution in the early 1990s did not produce as large a change in productivity as earlier innovations like railroads, cars, immigration, financial instruments, women in the marketplace, etc. What I like about Gordon’s writing is that he proposes we use basic economic theory to explain certain observable phenomenon, like the upsurge in labor productivity in the 1920-1950 interval. "In a competitive market, the marginal product of labor equals the real wage, and economists have shown that labor’s marginal product under specified conditions is the share of labor in total incomes times output per hour. If the income share of labor remains constant, then the growth rate of the real wage should be equal to that of labor's average product, the same thing as labor productivity. Could an increase in real wages have caused, directly or indirectly, the upsurge in labor productivity that occurred between the 1920s and 1950s?" We should really be looking at the need to increase real wages now, to solve issues of productivity and growth, taxes and national income, income inequalities and budget deficits. I believe even Republican small-government adherents will be shocked at what increased wages will unleash in the cash-starved labor economy. A corporation's profitability will be affected, but there is plenty of fat in the wage system that can be cut. We can’t force corporations to flatten their pay scales to increase payments at the lower end of wage scale and decrease payments at the top, but we can, and have, used tax policy and other inducements to curb the worst tendencies. Gordon explanation for the American Great Leap Forward in economic terms was the Great Depression and World War II. The New Deal was the result of the Great Depression, raising real wages and a shrinkage in weekly work hours. Substitution from labor to capital as a result of real wage increase is evident in the data on private equipment investment. Additionally, the reorganization of business after the drop in profits and output increased efficiencies not realized to that time. The effects of a war economy on top of these changes is clear. What really struck me about Gordon’s charts and graphs is how closely productivity and growth aligned with the entry of women into the marketplace in significant numbers, and how, when they retreated to fuel the baby boom, growth subsided. Know it is only a factor, but just sayin’…maybe we should let women run the country and the economy for awhile 👧🏽 and see what happens. There is no question there would be changes in how we do business. Ultimately Gordon is not prescriptive except to say that we should be putting much more money into preschool education than we are currently doing, given its proven benefits. We could also basically ‘brain drain’ the rest of the world through immigration policy, if we wanted. That idea makes me uncomfortable, but so does the irrational immigration policy we have been pursuing for the past two administrations. The immigration policies of the current administration do not bear discussion. Paul Krugman reviews Robert Gordon.